Body-Solid carries a full line of commercial products perfect for whatever application you need. With one-stop shop capabilities we can provide all of your Fitness needs whether it is a small or large facility. All products are in stock and immediately available. Most products will ship within 3 days of your order. With so many choices, here is a short guide to our commercial product lines. Much more information is available on line (www.bodysolid.com) and in our commercial catalog. Our premium single station line designed with the functionality Body-Solid is known for in a sleek modern look perfect for any itness facility. Body-Solid's original commercial line with classic designs and great options. 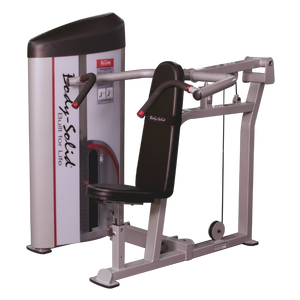 Designed for space challenged situations, each machine combines 2 exercise functions and is modular allowing them to be combined into a three or four stack multi-function gym as well. Our best and most economical single station option for smaller studios or even home use. For the plate loaded enthusiast, these machines combine ine tuned ergonomics with top quality construction. These commercial quality strength products round out the Proclub Line lineup featuring the same economical prices with uncompromised design and durability as the others. there is no reater flexilbility than one of Body-Solid's multi stack gyms providing multiple exercise options in a compact space saving footprint. Monkey Bars, Bar Holder, Band Pegs, Ball Throw, Adjustable Dip, Double Pull Up, Flying Pull Up, Heavy Bag and Hanger, Kettlebell Tray, Lift Offs, Medicine Ball Tray, Multi-Grip Pull Up, Ball rebounder, Stability Ball Holder, Safety Catches, Single Pull Up, Adjustable Plyo Step, Suspension Rings, T-bar Row, U-Link, Weigh Plate Horn, and Weight Plate Horizontal Storage. Offering a complete suite of products, our Cardio products offer great user interfaces with the same high quality design and construction that Body-Solid is known for. With a wide variety of products from Medicine Balls to Stability Balls, Jump Ropes to Resistance Bands, weight lifting bars of all sorts, multiple styles of dumbbells, kettlebells and weight plates, Body-Solid Tools provides the final touches for any fitness studio or center.